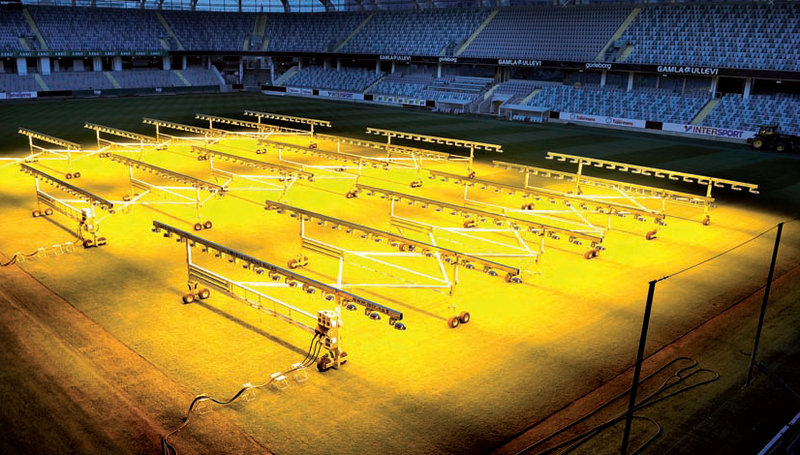 As reported by Linda McIntyre in this month’s issue of Landscape Architecture Magazine (Friday Morning Lights), U.S. sports stadiums are emulating their European peers by deploying massive lighting rigs to ‘sun’ their turf fields. Due to local climate conditions, the shade-inducing architecture surrounding the pitch, or a combination thereof, turf fields often have areas that do not get adequate sunlight, or just cannot regenerate as quickly as desired after heavy use. European companies such as Mobile Lighting Rig and SGL Concept custom manufacture the collapsible structures which can be spread out across large swathes of a field. 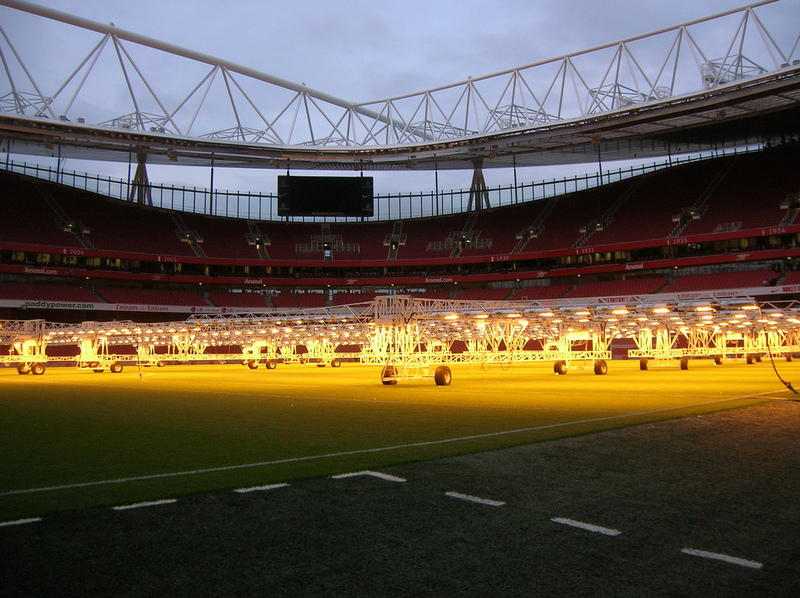 Or, smaller components can be installed in high use areas – such as the foreground to the goals – to ‘repair’ isolated patches of fatigued turf through supplemental photosynthetic exposure. 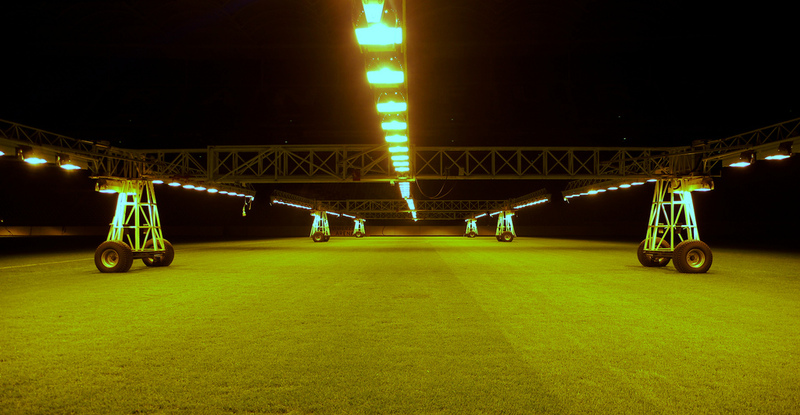 At such times we could see the perpetual making of the field, such as the showers of the irrigation system, the ripping out and re-installation of strips of turf, the application of fertilizers and ground striping, the glacially slow wanderings of the grow lights, and so on; the stadium as temporary greenhouse. If one were to meticulously diagram all this behind-the-scenes activity, like artist Alan Ball has wonderfully done for game events, we might see something similar, yet different. The overlaid traced lines would be far more rectilinear, distributed and most-likely a bit monotonous, like the back and forth movements of mowing the grass. 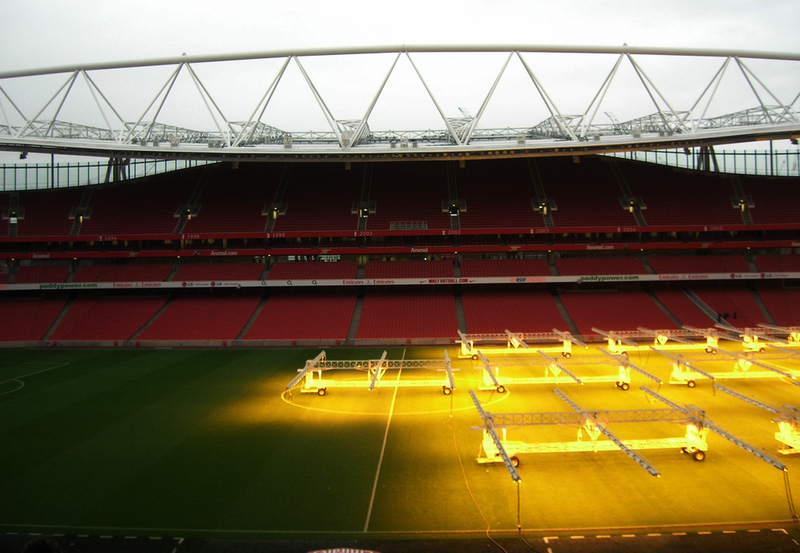 Yet temporally there would be signs of competing and cooperative tactics of spatial activity – such as irrigation flow working in tandem with grow lights, as one can’t irrigate the field when the lighting rigs are on it, for obvious reasons. There’s an extensive and strategic choreography to it all, which most of us never see. Like the urban field itself, the design and repair of the urban arena is fundamental to what can be staged upon it. It’s the bracketed background of the event. Sitting in the bleachers under the seemingly banal, yet far more common conditions of non-game time, watching the grass grow should one actually be allowed, would offer an apt meditation on our extensively ‘black boxed’ infrastructure. Above the glow, we might reflect on the amazing peculiarities of the networked recycling of light happening in front of us – the harvesting of distant, geologically stored solar energy embodied in coal or natural gas, transported to and processed in power plants, distributed back across the landscape and subsequently reapplied through a mobile grid of finely tuned lighting fixtures. All of which calls to mind Stephen Graham’s notion of ubiquitously cyborged infrastructure, or “the ways in which the technological circulations sustained by infrastructural assemblages inseparably blend together the social relations of urban life and the relations between cities with the natural and biospheric processes on which they rely” (quote from Disrupted Cities) Without the hybridized grasses growing in manufactured and extensively managed soil and systems, no arena for staged and athletically perfect urban drama would be played out. This is quite fascinating. I had no idea that it needed anything beyond sprinklers, mowing and occasional re-seeding. I guess this is where artificial turf gains traction.